A 4th century B.C. 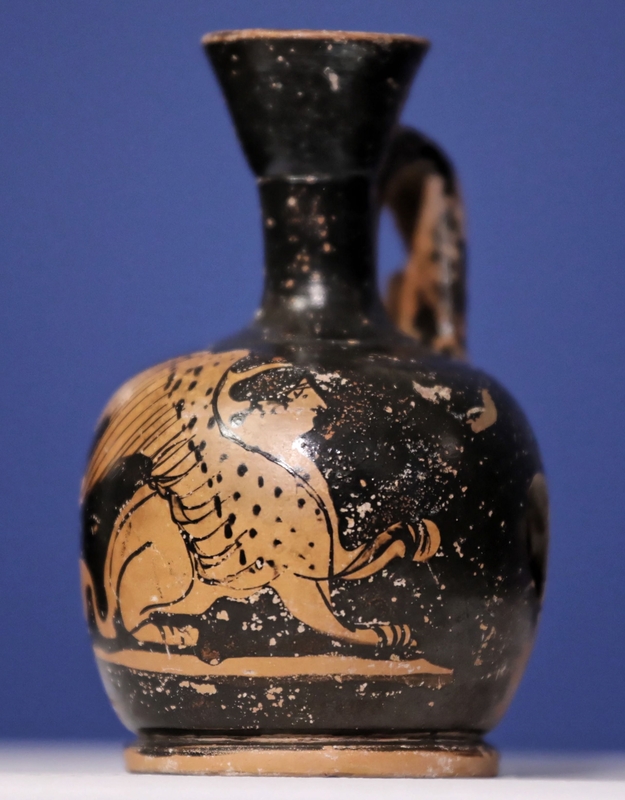 Greek vase that was stolen from the National Museum in Warsaw by German occupiers has been returned to Poland. 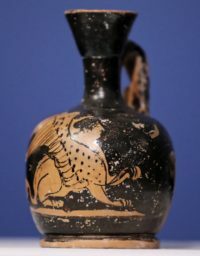 The red figure lekythos with a rare sphinx design, one of very few in Poland, is a small piece at just 3.7 inches high and 2.4 inches wide, but it is of immense historical importance because it is the first archaeological object plundered during the war that has been recovered by the nation. The vessel, made to store oils and perfumes, was discovered during excavations in the east Crimean town of Kerch, one of the most ancient cities in Crimea which was founded as the Greek colony of Panticapaeum 2,600 years ago. By the early 20th century, it belonged to Józef Choynowski, a Polish collector who was born in the Kiev area. An avid archaeologist, he participated in digs in Ukraine and elsewhere in Russia and amassed a large, ecclectic collection of prehistoric crafts, prints, paintings, osteological remains and archaeological material. In 1901, Choynowski decided he would exhibit his entire collection in Warsaw and then donate it to the museum. The exhibition opened in the autumn of 1902. A few months later, on March 19th, 1903, Józef Choynowski officially donated his collection to the Society for the Encouragement of Fine Arts in Warsaw, stipulating that it must be permanently on display and that no part of it would ever be loaned or moved out of Warsaw. In December of 1923, Choynowski’s collection of 4380 objects was transferred to the National Museum in Warsaw. It would know less than 20 years of peace. Art historian, archaeologist and SS Untersturmführer Peter Paulsen was in Poland within days of Warsaw’s surrender on September 27th, 1939. As leader of the Sonderkommando Paulsen, his brief was to “secure” objects of archaeological and historic significance from the conquered territory. Nazi officials from Hitler on down had no high opinion of Poland’s cultural patrimony, so the artworks and antiquities deemed to be “Germanic” cultural assets were the explicit focus of the SS special command. The Veit Stoss altarpiece in Krakow, for example, the largest Gothic alterpiece in the world made in the late 15th century specifically for the High altar of Krakow’s St. Mary’s Basilica, counted as German because the sculptor Veit Stoss was originally from Nuremburg, even though he lived and worked in Krakow for 20 years and the altarpiece had been commissioned by the regent of Poland. In the end, the Sonderkommando Paulsen just stole everything it could and shipped it to Germany to stash in museums, castles, salt mines wherever they had a nook or cranny to accommodate the ever-expanding collection of patrimony plundered from occupied countries. Warsaw’s library and the national museum were stripped of far more than the few items listed as desirable in lead-up to the invasion. The Choynowski collection was plundered and many of its most prized pieces exported to Germany. Without any clear records of what was taken by the SS, dispersed or destroyed by the ravages of war, Poland’s Ministry of Culture has struggled since the war to figure out which of Choynowski’s pieces are missing. Its database of war losses currently lists about 60 objects from the collection, but that is in no way definitive. Thankfully, it was enough to get this one little lekythos back. The vase was slated to be sold in 2017 at the Gerhard Hirsch Nachfolger auction house in Munich. The auctioneers checked the database, saw that it was looted from Poland during war and alerted the ministry. The seller was Ingrid Haack. It had been in her family for decades and she had no idea of its ugly ownership history. She promptly agreed to withdraw it from the sale and return it to Poland. This entry was posted on Sunday, November 4th, 2018 at 11:54 PM	and is filed under Ancient, Modern(ish), Museums. You can follow any responses to this entry through the RSS 2.0 feed. You can skip to the end and leave a response. Pinging is currently not allowed. A funny coincidence: In Witaszkowo/ Vettersfelde, in what now is the border region between Germany and Poland, the so-called ‘Vettersfelde Treasure’ (unearthed in 1882), in return seems to originate from the Panticapaeum area. The objects are connected to the animal-themed Scythian art. On a sidenote, it is ‘Nuremberg’ (not to be confused with ‘Nurburg’, btw, ‘Wit Stwosz’ was clearly not from Poland). PS: Olive oil (‘Lekythoi’ were used to store oil) is particularly light-sensitive, while what is usually sold in supermarkets as ‘olive oils’ is usually not sensitive at all. Thus, i would rather recommend the stuff from the supermarkets for making perfumes.